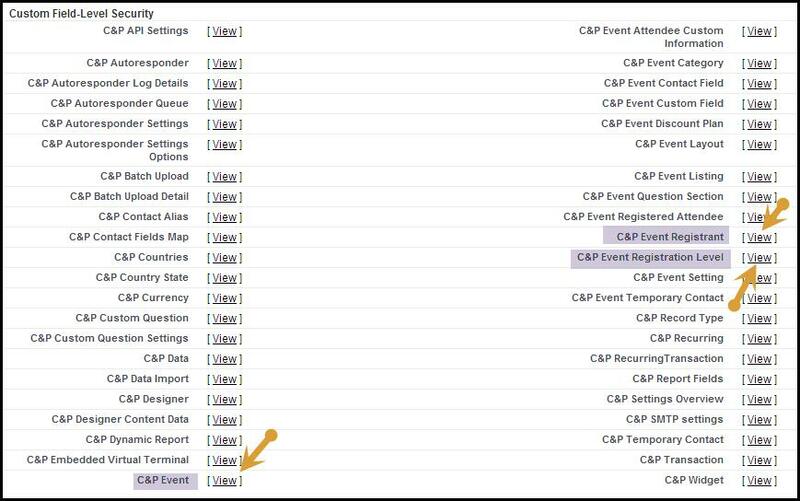 In this release an additional option is available for testing each event and level. Step 3 is critical since Salesforce does not allow for default value of a pick-list to be defined during the installation. Once installed the MODE will be set to "None" and events with MODE=None will not be live. It is extremely critical to set this mode accordingly once the upgrade is complete. The following steps are required for upgrading from version 1.99 to 1.1000. IMPORTANT STEP: Make sure to keep Event Mode as Active. This is a new feature and if not set to ACTIVE all events will become inactive. Go to "C&P Event Registered Attendees" related list and click on the "Related List Properties" Option. You will see "Buttons" block just below the "Columns" block. click on the + to expand the buttons section. From “Available Buttons" select the "New Registration" button and add it to the "Selected Buttons Area." Click the OK button and save the changes. With this option, you can register the attendees using the new Manual Registration terminal (Box Office). Follow the same steps outlined in Step 4 to add the New Registration button to the Event Registrant section. While not mandatory, adding the button will help with registering attendees from both lists.